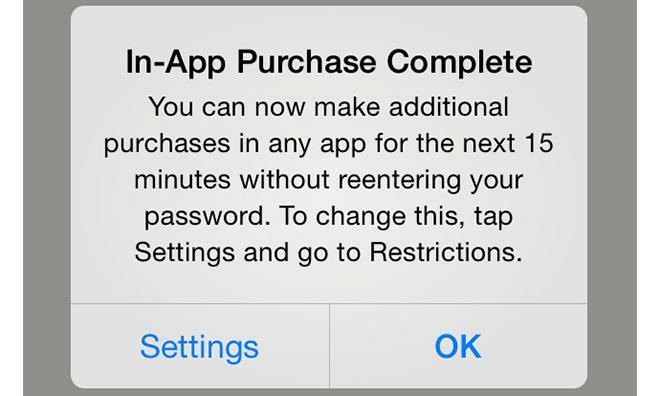 Apple's recently-released iOS 7.1 update now shows a pop-up warning message for users making in-app purchases for the first time, reminding them of a 15-minute grace period in which additional purchases can be made without reentering password. As seen above, the iOS 7.1 update's informational message, which informs users of Apple's in-app content policies, is displayed after completing an initial purchase. The pop-up offers direct access to iOS device Settings, where users can apply in-app purchase limitations, including an option to require passwords for every buy. Alternatively, users can turn off in-app purchasing altogether. While the 15-minute no-password window has been in effect since the iOS App Store launched in 2008, some users may not be aware of the policy. Apple recently settled a lawsuit leveled by the U.S. Federal Trade Commission over the company's implementation of in-app purchasing. The government body argued that the current system made it too easy for children to make purchases without parental consent. In 2013, Apple came under fire for the supposedly lax App Store policies. One high-profile case involved an 8-year-old British girl who managed to charge over $6,000 to her father's account with content bought through so-called "freemium" apps. Apple refunded the money. Under the FTC settlement terms, Apple will refund some $32.5 million to parents whose children made unauthorized purchases. In addition, Apple agreed to change how the App Store operated to ensure purchases are being made from legitimate account holders. A report last week claimed the company was having technical difficulties in implementing the modifications, however, as the Mar. 31 settlement deadline approaches.